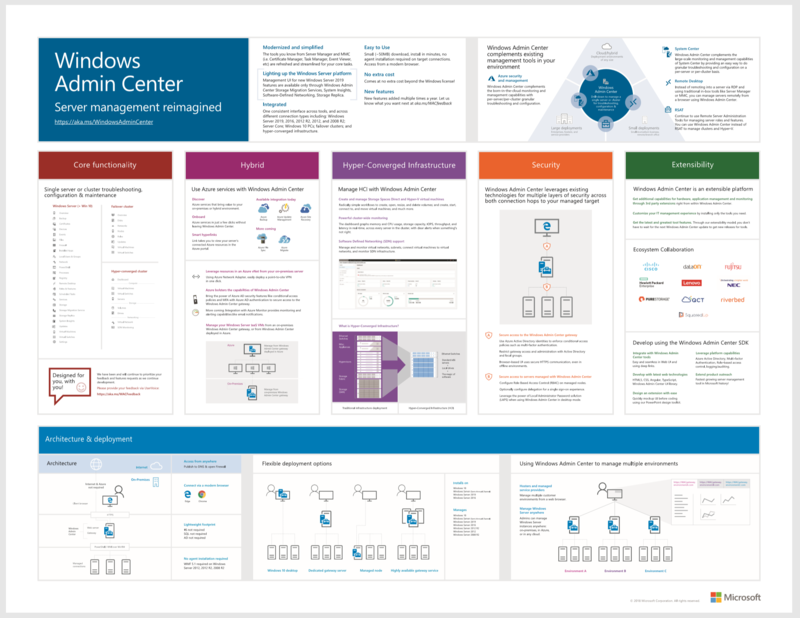 Windows Admin Center (codenamed Project Honolulu) is an evolution of Windows Server in-box management tools; it’s a single pane of glass that consolidates all aspects of local and remote server management. As a locally deployed, browser-based management experience, an Internet connection and Azure aren’t required. Windows Admin Center gives you full control of all aspects of your deployment, including private networks that aren’t Internet-connected. What is Windows Admin Center? What type of installation is right for you? Version 1904 is the most recent GA release that introduces the Azure Hybrid Services tool, and brings features that were previously in preview to the GA channel. Version 1903 brings email notifications from Azure Monitor, the ability to add Server or PC connections from Active Directory, and new tools to manage Active Directory, DHCP, and DNS. Version 1902 added a shared connection list & improvements to software defined network (SDN) management, including new SDN tools to manage ACLs, gateway connections, and logical networks. Version 1812 added dark theme (in preview), power configuration settings, BMC info, and PowerShell support to manage extensions and connections. Version 1809.5 is a GA cumulative update that includes various quality and functional improvements and bug fixes throughout the platform and a few new features in the hyper-converged infrastructure management solution. Version 1809 was a GA release that brought features that were previously in preview to the GA channel. Version 1808 added Installed Apps tool, lots of under the hood improvements, and major updates to the preview SDK. Version 1807 added a streamlined Azure connect experience, improvements to VM inventory page, file sharing functionality, Azure update management integration, and more. Version 1806 added show PowerShell script, SDN management, 2008 R2 connections, SDN, scheduled tasks, and many other improvements. Version 1804.25 - Maintenance update to support users installing Windows Admin Center in completely offline environments. Version 1804 - Project Honolulu becomes Windows Admin Center and adds security features and role-based access control. Our first GA release. Version 1803 added support for Azure AD access control, detailed logging, resizable content, and a bunch of tool improvements. Version 1802 added support for accessibility, localization, high-availability deployments, tagging, Hyper-V host settings, and gateway authentication. Version 1712 added more virtual machine features and performance improvements throughout the tools. Version 1711 added highly anticipated tools (Remote Desktop and PowerShell) along with other improvements. Version 1709 launched as our first public preview release.